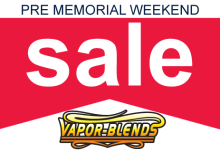 Vapor Blends > Uncategorized > MOD Drip Juice Now Available! We’re excited to unveil Vapor-Blends Premium MOD Drip Juice. It will be available in 30 ml Glass bottles, 3 Strengths 0 mg/ml(NICOTINE FREE), 3 mg/ml and 6mg/ml. 7 flavors (more coming). FOR USE WITH MECHANICAL VAPING MODS ONLY!